The MA-201fet Condenser Microphone from Mojave Audio features a large-diaphragm, solid-state condenser design that provides a warm, full tone. It is suitable for a variety of vocal and instrumental applications, including voice over and broadcast, kick drums and guitar amps, electric guitar, piano, drum overheads, drum rooms, and acoustic instruments. 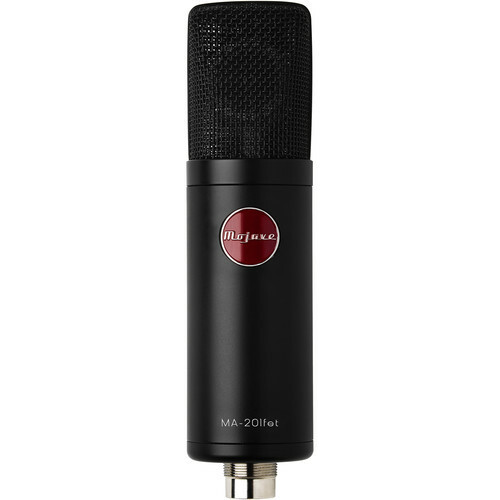 The microphone contains a military-grade FET and a Jensen audio transformer for clean, clear sound with low noise and a high SPL handling capability. There is a hand-selected 3-micron 1.0" capsule with a cardioid pickup pattern for maximum off-axis noise rejection. The MA-201fet operates on 48V of phantom power and includes a protective case and elastic shockmount. Box Dimensions (LxWxH) 10.6 x 9.7 x 5.1"